Dr. Ming Ji serves as the technical monitor for NCAS-M. As a technical monitor, he ensures that the science and policy conducted at the Center is compatible with NOAA and, in particular, the NWS. Dr. Ming Ji is the Director for the National Weather Service (NWS) Office of Science and Technology Integration (OSTI), since March 2015. As the OSTI Director, Dr. Ji leads over a 100-person team that supports major research and development areas which include, but not limited to, improvement of operational atmosphere, ocean, land, sea ice, hydrological and other components of environmental prediction models, operational guidance and decision support tools, and social science integration. Major components of OSTI include the Operational Proving Ground (OPG) facilities testing of advanced operations, services, and science and technology (S&T) capabilities; research-to-observations (R2O) and operations t-to-research (O2R) process; and, the Meteorological Development Laboratory (MDL). He is also the NWS Dr. Ji is also the NWS representative on the NOAA Research Council. From 2013-2015, prior to leading OSTI, Dr. Ji was the Acting STI Portfolio lead and was responsible for portfolio management of the NWS research, development and operations transition portfolio including planning, integration, and oversight of science and technology improvement activities across the NWS. From 2006-2015, Dr. Ming Ji was the Director of the National Center for Environmental Prediction (NCEP) Ocean Prediction Center (OPC) and served as Acting NCEP Director from July through December 2013. As the OPC director he was responsible for directing and planning the science, technology and operations for marine weather, ocean and sea ice safety services supporting maritime navigation safety, coastal hazard disaster risk reduction, and the development of operational ocean forecasting capability. He also served as the NWS representative on the NOAA Ocean and Coast Council (NOCC) and as the Service Program Coordinator for the WMO-IOC Joint technical Commission for Oceanography and Marine Meteorology (JCOMM) from 2007 to 2015. Before joining the OPC, Dr. Ji directed NOAA’s seasonal to interannual climate research and prediction programs at NOAA Climate Program Office, from 2001 to 2006, where he focused his efforts on enhancing NOAA operational climate forecasts at the NWS, and enhanced applications and services of seasonal climate forecasts for resource management at regional and sectorial levels. 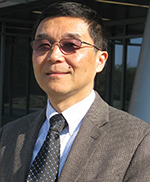 From 1986 to 2001, Ming Ji was a research scientist at NCEP’s Climate Prediction Center and Environmental Modeling Center (EMC) and later served as the Chief of EMC’s Climate Modeling Branch. His research interests at NCEP span the multi-disciplinary area of climate variability and prediction, ocean data assimilation, El Nino and seasonal climate forecasting, and climate modeling. He has authored or co-authored more than 35 peer reviewed journal articles and book chapters. Dr. Ji received a B.S. in Physics at Peking University, Beijing, China in 1981 and a Ph.D. in Meteorology at University of Maryland, College Park, Md. in 1989.